In 1978 the Ellice Islands became independent as the nation of Tuvalu. In 1979 the Gilbert Islands, the Phoenix Islands and the Line Islands became independent as the nation of Kiribati. The stamp issued in 1969 commemorating the first anniversary of the University of the South Pacific features a map of South Pacific Islands. The Solomon Islands, the New Hebrides, the Gilbert Islands and the Cook Islands are generally in a proper relationship to each other. The Ellice Islands, Samoa and Tonga are south, not east of the Gilbert Islands (Kiribati). Viti Levu and Vanua Levu, the Fiji Islands, where the University of the South Pacific is located, are in the proper place, but they are comparatively several times too large. 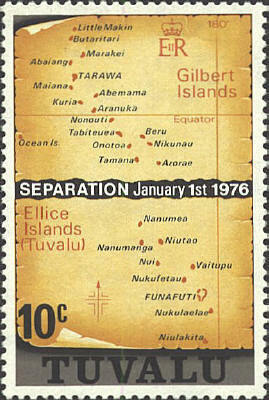 In the same set the middle value stamp shows the islands of the Gilbert and Ellice Islands. The Ellice Islands are east rather than south of the Gilbert Islands, and much closer together than they should be. Tarawa is the fifth island from the top. It is also the large atoll in the center of the stamp. It is the capital of the Kiribati Islands. This stamp shows the correct relationship between the two groups of islands.